The saddest break-up of this year for me has to be Reese Witherspoon and Ryan Philippe. One of the original beautiful couples, they met at Reese's 21st birthday party when she famously introduced herself saying "you must be my present". Over the years they have been regulars in 'best dressed couple' lists and have had two gorgeous children, Ava Elizabeth and Deacon. They managed to keep their marriage as private as is possible for any Hollywood stars and even Reese's part as June Carter in Walk the Line didn't seem to create too much of a media frenzy. So I found it a bit of a shock when the rumours of their split started surfacing. I was even more surprised when Reese filed for divorce citing 'irreconcilable differences'. Then we heard about Ryan's alleged affair (I use the term alleged for reasons of politeness... we all know they were caught necking in a sushi restaurant) with 24 year old Australian actress Abbie Cornish, who he met of the set of Stop Loss. I was seriously hoping that it was all rumour and they would be able to reconcile their irreconcilable differences but no. Reese has returned to her native South Carolina taking the kids with her and enrolling them in school. I can't say that she hasn't made the right move in my eyes. As much as I adored them as a couple its good to see a woman catch her man red handed and not stand for it. I've definitely been feeling recently that the monogamy part of marriage has been taken a little too lightly. Reese we are thinking of you I hope you have a fabulous Christmas safe in the knowledge that you cle arly have more balls than the majority of other women in the business and are taking one back for the jilted and doormatted women everywhere. So for you and all the single parenting, traveling and saddness you have gone through this Christmas call a sitter, put on a CD, put your feet up and try some of these face pampering treatments on for size. 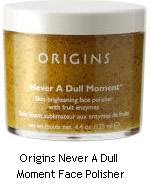 My favourite face masks have to be made by Origins. There seems to be one for every skin type and every need. The two I've tried are You're Getting Warmer purifying face clay mask and Drink Up. I was a bit worried about using You're Getting Warmer as I have quite dry skin but, again if you use a good moisturiser afterwards this is fine. Its a ten minute mask which warms up and draws out impurities. I love to use this after I've used a Biore strip actually. It makes you're whole face feel literally spotless. Drink Up is much less dramatic but again a real wonder especially for dry skin as this is soothing and does what it says on the tube. I try and alternate these two. Again about ten minutes after using a face mask or skin treatment I like to use a good quite thick moisturiser to make sure that all the goodness is kept in. I think its important to not over 'drown' your face though so let everything settle before moisturizing.